Anyone who has read any of my live reviews before, (there must be someone), will know that I am no big fan of this type of album, and the whole point of going to see a band live, is to actually see a band live. 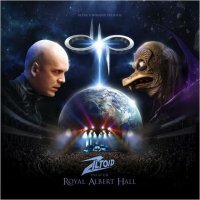 Admittedly, this one is from Devin Townsend, so you would probably expect something a little different, but still, live albums only really work for me if I have been to the actual concert recorded (and I can hear myself screaming over everything else, so that I can point this out to everyone, which never happens). On this occasion I hadn't, so fortunately, this package also includes a DVD as well as the three CDs. I will therefore base the review on the DVD, as the audio discs are just the same thing, musically, as the DVD. First thing I have to say is that Townsend doesn't mess about when it comes to live spectacles. The Royal Albert Hall as a location for starters with a production that sees numerous characters on stage, The War Princess, (played on this occasion by co-writer of the song Dominique Lenore Persi), Poozers and Ziltoid himself, as well as a group of backing singers on either side of Townsend, Captain Spectacular on screen and the band of course. Starting with a short film of Ziltoid, the first part of the show is the 'Dark Matter' half of the 'Z2' album, which tells the final part of the Ziltoid story (or does it?). A lot of this music is from Townsend's heavy side, not too far from his Strapping Young Lad days and, for me, it is an acquired taste but there are many people here, and out there, who like it as much as his more Progressive offerings. There is considerably more of this during the second half, which Townsend explains is made up from fan's requests, some of which have never been played live before. This part is not as theatrical and, as the main man explains, they even dress down for this section. Epic sounding songs like 'Earth Day', 'Christeen', 'Supercrush! ', 'Kingdom', 'Funeral' and the excellent 'Universal Flame,' for which everybody connected with the show, including Townsend's son Reyner, (whose request this was), join him on stage. I do have one criticism however. The DVD appears not to have been recorded in HD, and on a few occasions, it takes a while for the camera to get into focus when the angle changes. Despite that small grumble, this release is still worth getting, and the best way to avoid the picture being out of focus is to actually be there for the next one.